What can caregivers or healthcare workers do to help prevent dehydration in our aging family or patients? The answers to this question may seem like common sense, but when we are overwhelmed with caring for an aging family member or busy with our case-load of patients, we may overlook these simple but important steps to preventing dehydration. First: Take time to really listen to your elderly family member or patient. Find out what she likes to drink, how often she eats meals, when she takes medications. This information can give clues to ways you might help her stay hydrated. With these things in mind, consider the following suggestions. Keep water within reach – in a pitcher or drink-cup – whichever works best for your patient or family member. 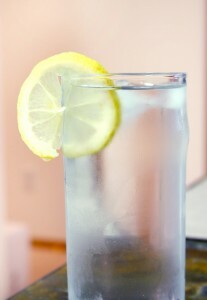 If plain water is not palatable to the patient, consider adding small amounts of flavoring, such as lemon juice, honey or sugar free sweetener like Crystal Light. Even small amounts of flavoring can encourage more water intake in some patients. Offer verbal prompts throughout the day. Some older adults don’t remember to drink due to cognitive impairment and since thirst is less acute, they really may not think about drinking. You can help remind them. Encourage taking medications with plenty of water. Some studies have shown that people who take medications, drink significantly more water than their cohorts who do not take medications. This is an ideal way to provide small but potentially significant amounts of fluid. Especially if your patient takes medications more than once during the day. Talk together about the importance of preventing dehydration. Many older adults are interested and involved in their own health management. For these people, education may be all that is needed to prevent dehydration. We’d love to hear about your experiences with helping older adults avoid dehydration. You can share in the comment section below. This entry was posted in Home Health, Nursing Care and tagged dehydration, elder care, fluid balance, prevention on July 18, 2013 by Melody Newey. Melody Newey is a Registered Nurse. Her twenty-five-year career includes, behavioral medicine, homecare, infusion specialties, occupational health, infection control, and her current role as nephrology nurse manager. She remains connected to her roots in homecare and still makes home nursing visits in her community. In addition to blogging at Envision Home Health, she writes for several religious blogs and grows a respectable garden. She lives in Utah and enjoys hiking the trails of the Rocky Mountains year 'round. © 2013 by Envision Home Health & Hospice. All rights reserved.